How does a car battery work and how is it constructed? The traditional function of the battery in the engine compartment is well known: Without the battery the vehicle cannot be started. 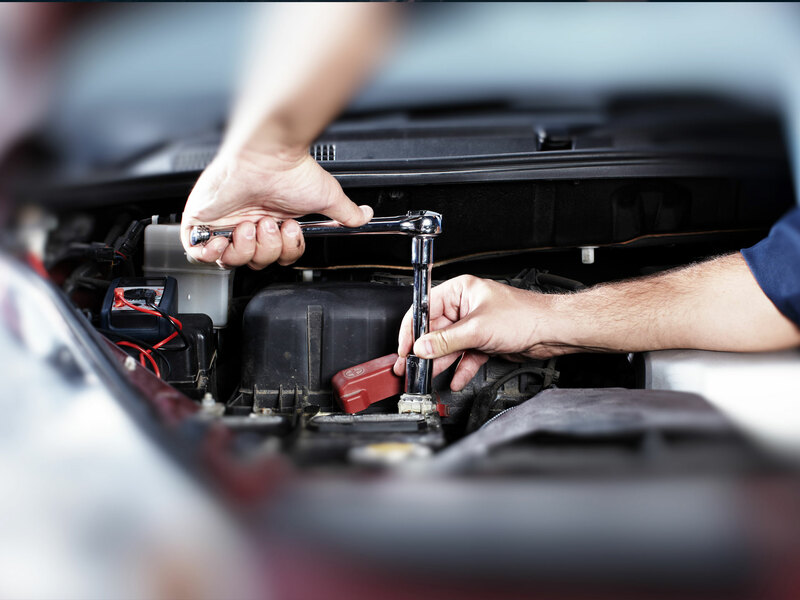 In addition to the starter motor, the spark plugs, glow plugs, lights and electronic applications all require electrical energy. But how is a battery constructed and how does it work? Many drivers become aware of the heavy weight of car batteries when they buy a new one. Weights from about 10.5 kg, up to 30 kg are possible. The reason for this is the lead plates in the battery cells. Positive plate: In a lead-acid battery, the positively charged plate (active material) consists of lead oxide (PbO2) which is immersed in an electrolyte. 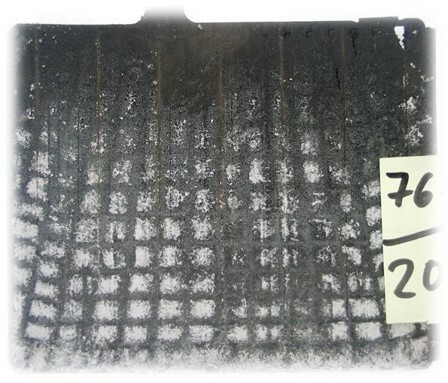 Positive grid: The positive grid consists of a lead alloy and is used to hold the active material and as a current collector. Negative plate: The negatively charged plate (active material) consists of pure lead (Pb), which is also immersed in an electrolyte. Negative plate: Like the positive plate, this also consists of a lead alloy and serves the same purpose. The electrodes with different charges are separated by a separator bag. The electrolyte is a mixture of sulfuric acid (H2SO4) and distilled water. This electrolyte can be in liquid form (as in conventional wet batteries or in the enhanced EFB technology), in gel form, or bound in a glass mat (as in AGM technology for newer start-stop applications). Several positive electrodes form a positive plate set and several negative electrodes form a negative plate set. Together, a negative and a positive plate set form a plate block. A plate block is a battery cell. A conventional starter battery consists of 6 cells connected in series, each with a nominal voltage of 2 V, which results in a voltage of exactly 12.72 V when the battery is fully charged. The capacity and the cold start capability of the battery results from the number of plates per cell. Rule of thumb: The more plates which a cell contains, and therefore form a larger surface, the larger the cold start power (CCA) which the battery can deliver. However, if the space in the cell is used for fewer, but thicker plates, the cycle stability is increased. This means that the battery is designed for a higher charge throughput (continual charging and discharging process). The cells are contained in a casing which is made from acid-resistant plastic (polypropylene). In a conventional SLI battery, this is closed with a cover with a labyrinth system which prevents the battery fluid from escaping and separates the liquid from gas. Early batteries had screw plugs which enabled them to be topped up with distilled water. Modern batteries are completely maintenance-free. Water does not need to be, and must not be topped up. Although AGM batteries still have “one-way plugs”, these must not be opened under any circumstances. The electrolyte, a mixture of sulfuric acid (H2SO4) and distilled water decomposes into positively charged hydrogen ions (H+) and negatively charged sulfate ions (SO42-). At the same time, electrons (2e–) travel from the negative to the positive electrode via the external consumer. To compensate for this flow of electrons, sulfate ions travel from the electrolyte into the negative electrode, where they react with the lead (Pb) to produce lead sulfate (PbSO4). 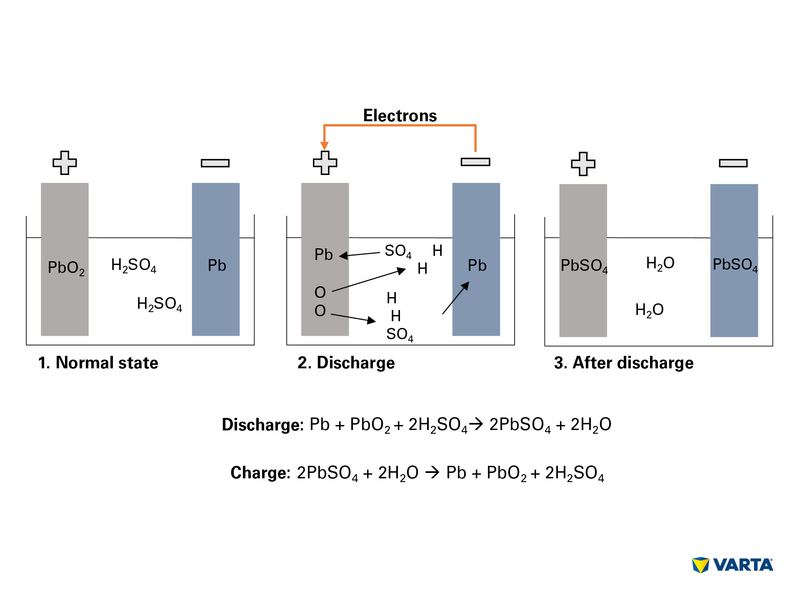 Lead sulfate is also produced in the positive electrode: The bonding of oxygen (O2) in the lead oxide (PbO2) is broken by the transfer of electrons and the oxygen passes into the electrolyte. The remaining lead (Pb) bonds with the sulfate (SO4) from the electrolyte. There, the oxygen bonds with the hydrogen to form water (H2O). As the sulfuric acid is used up by the formation of lead sulfate, the concentration of the electrolyte solution reduces. When the concentration of the sulfuric acid falls below a certain level, the battery has to be recharged. During charging, the chemical processes take place in the reverse sequence. At the end, the original elements can be found: The positive electrode consists of lead sulfate (PbSO4), the negative electrode consists of pure lead (Pb) and the electrolyte consists of dilute sulfuric acid (H2SO4). As this conversion process is associated with losses, a battery can only withstand a limited number of charging cycles. Its useful life is therefore limited. If a battery is charged with a voltage which is too low, or if it always operates with a voltage which is too low (below 80%) acid layering, also referred to as stratification, occurs. The acid in the electrolyte stratifies due to poor mixing. Various densities cause layering of the sulfuric acid on the bottom and water in the top area of the battery. Because of this, only the middle section of the electrolyte, i.e. only a third, can be used for the discharging and charging process. A possible cause of acid layering is mainly short journeys with the simultaneous use of a large number of electrical consumers. In this case, the alternator does not have enough time to recharge the battery. A result of acid layering is sulfation. If this occurs in the battery, or if it is not constantly charged to an adequate level, the lead sulfate (PbSO4) crystallizes on the electrodes, to form larger crystal structures over the course of time. This process is known as “sulfation”. The crystallization prevents the re-conversion of lead sulfate into the original components lead or lead oxide, which results in the prevention of charge acceptance and reduction in the cold start power. 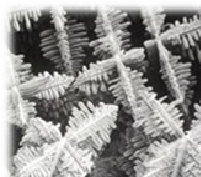 Sharp crystals may also damage the separators or cause short circuits in the cells. To counteract this effect and prevent premature battery failure, a battery should never be subjected to a low charge level over a long period. For this, it is advisable to test the battery regularly and to fully charge it if necessary. Would you like to know more about this topic? How to properly charge a battery. Up to now, conventional lead-acid batteries have had a high share of the market. However, the market is changing rapidly: Innovative battery technologies for start-stop vehicles such as AGM use acid which is bound in a mat to provide greater cycle stability and guarantee reliable performance in vehicles with increased energy requirements. A further advantage of AGM: Acid layering is no longer possible due to the bound acid. 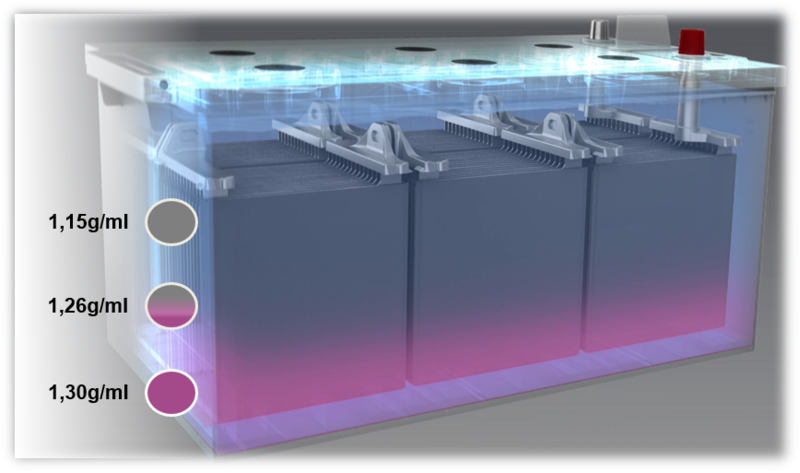 A new generation of car batteries for micro-hybrid vehicles operates at 48V and uses cells with lithium ion technology.